The Small Business Energy Initiative (SBEI) is led by the Institute for Market Transformation (IMT) and the Greater Cleveland Partnership/Council of Smaller Enterprises (GCP/COSE). With support from the U.S. Department of Energy, the Initiative is partnering with local chambers of commerce and similar small business organizations from five regions across the country to arm them with leading-edge tools, best practices, and guidance to create energy efficiency and sustainability opportunities for their small business members that are good for the bottom line and good for the planet. In our SBEI Q&A series, we’ll learn from the changemakers who are rolling up their sleeves every day to build an energy-efficient and prosperous future for their business members and local communities. 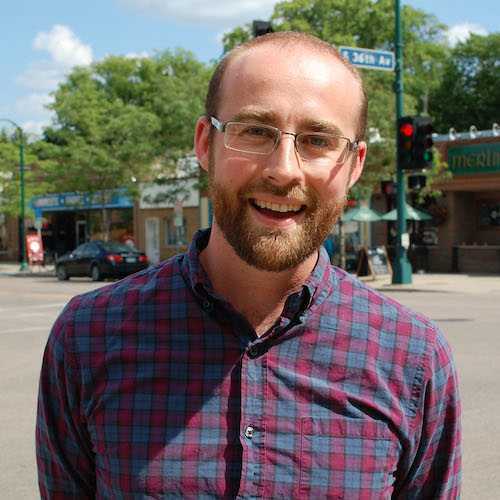 Matt Kazinka, Sustainability Coordinator for Lake Street Council, shares how his organization is working with the Great Plains Institute, the city of Minneapolis’ Energy Technical Assistance Program (E-TAP), and other local groups to drive awareness and adoption of efficiency best practices and provide resources to economically and racially diverse small business landlords and tenants. 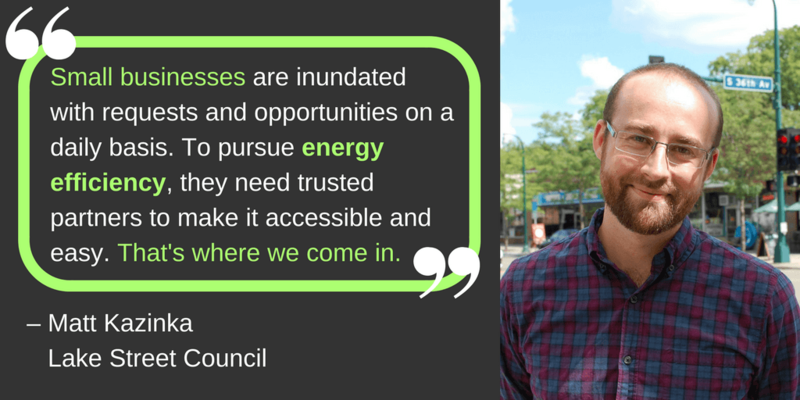 Can you tell us why Lake Street Council is working to drive energy efficiency for small businesses? The Lake Street Council exists to help businesses thrive. Energy efficiency is by and large an untapped area for chambers and organizations like ours to work in and help businesses take advantage of savings opportunities. There are energy-saving resources available that many business owners aren’t aware of, (so) if we have a grant to offer a business or the ability to put money on the table for making improvements, they really like that and it’s valuable to them because it removes upfront costs and creates long-term savings. People like to feel that they are getting a deal or taking advantage of an underutilized resource. That’s at the heart of energy efficiency. It’s not just about saving energy either—when businesses are doing a renovation they may not know they qualify for a rebate and are leaving money on the table for something they’ve already invested in. If a business is dealing with safety concerns and they want more lighting to make customers feel safe, there’s a whole structure to install new LED lights and make the investment more affordable. We are here to make their lives easier by helping them tap into these opportunities. How are you collaborating with other local organizations on energy efficiency? Lake Street Council’s energy program has gone through several iterations. Our work in Minneapolis for the last six years has benefited from a partnership with the Great Plains Institute (GPI) — one of their goals is to maximize economy-wide investment in energy efficiency in Minnesota, Michigan, and across the U.S. GPI has been helping us refine our energy coaching model, which harnesses the experience, wisdom, and expertise of local energy experts to support businesses and business development nonprofits to make positive changes. We’ve collaborated with many other organizations, as well as city government to test out this model. For example, we are currently working with the city of Minneapolis on their Energy Technical Assistance Program (E-TAP) to drive awareness and adoption of efficiency best practices and provide resources to economically and racially diverse small businesses. Through this program, the city has hired six neighborhood-based organizations to be energy coaches, and we are helping to provide training for those organizations with support from the Small Business Energy Initiative. Are you working with any of your local utilities on energy efficiency and your energy coaching program? Here in Minneapolis, the utilities have conservation improvement programs that are paid by utility customers to provide free services to businesses. We aim to leverage and expand the utilization of those resources and direct small businesses to those utility programs. Energy Smart, based out of the Minnesota Chamber of Commerce and the One Stop Efficiency Shop program, which is run by the Center for Energy and Environment (CEE) are two other good examples of how utility resources are being put to work by local organizations and how businesses are being connected with new energy efficiency opportunities. Our goal is to help ramp up these programs and leverage one another’s expertise to get to better outcomes and savings for local businesses. Can you provide a good example of how you’ve helped a local business take advantage of energy efficiency? There is a great case study about a popular Mexican restaurant in Minneapolis called Taqueria La Hacienda that’s been operating since 1999. The owner wasn’t considering pursuing energy efficiency at first because he felt the process would be too time-consuming. However, through our energy coaching program he was provided with a variety of technical and financial guidance to make the investment more manageable for him. With this support, the restaurant decided to move forward on upgrading its lighting to LEDs, which resulted in the restaurant achieving $1,677 in annual savings on lighting with a payback period of less than two years. The restaurant then went on to upgrade to a Demand Controlled Hood Ventilation (DCHV) System in its kitchen, saving the owner nearly $3,500 annually on energy costs. Something else I’d like to share anecdotally that I’ve gathered from our work and speaking to other Minneapolis business support organizations, is that the business owners who are participating in our energy efficiency initiatives are reflective of the communities that they’re in, in terms of the demographics of owners who are people of color, immigrants, and low-income entrepreneurs who are running their businesses while subsisting their families. It’s different community-by community, but a lot of the local organizations that are providing energy coaching services know these business owners from working on other community safety initiatives and providing more traditional business-focused services. So it doesn’t take a big new marketing campaign or new approach to do outreach. It’s about the messenger who knows how to reach owners already because they’ve worked with them before—this is central to the whole idea of the Small Business Energy Initiative. This neighborhood-level approach limits our reach in some ways, but I think we are catching more of the people who have a strong need for energy-saving programs and we are giving more equal access. What challenges have you encountered while trying to engage small businesses on energy efficiency and what kind of progress do you hope to achieve through SBEI? One of the biggest challenges we’ve had this year is how to navigate data access and data privacy rules. There are many people and groups like IMT working to improve energy data access so that we can know more about what success we’re having and be able to do big picture reporting on savings and impacts of efficiency programs in our cities and communities. With Lake Street Council’s energy coaching model, we are bringing in a third party into the utility program implementer-customer relationship. For the energy coach/third party to be successful, they need to be able to communicate with each party and have transparency. Currently, the utilities here are not keen on allowing that relationship to happen due to concerns over data privacy and rights, so it has been a big challenge to bring in players who will leverage skills and small business contacts. We are trying to figure how to best address this roadblock, and there is still more work to be done on that front. It’s not the easiest thing to get into, it requires building a lot of relationships and dealing with the system roadblocks—it is an investment. We are involved because we want it to be easier to save energy and make the system work better for other people and we think our businesses will benefit from it in the long run.